Strange Tales : #’s 122, 125, 129, 133, 149, 150, 159. 129 has staining is in low grade. 133 has warping. Rest in about G/VG (3.0) condition. 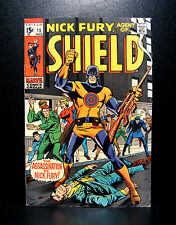 HYDRA Number 72 hires the services of Bulls-eye, a paid assassin, to kill Nick Fury. Fury is concerned that 3 CIA operatives have been killed, and feels SHIELD could handle the investigation better than they could. STRANGE TALES 143 !! CGC 9.0 !! S.A. CLASSIC !! 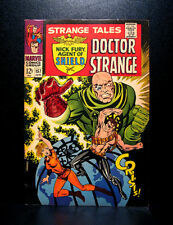 Strange Tales 143 in CGC 9.0 condition ! Classic Silver Age books and finally getting there recognition with the Doctor Strange movies ! Blackhawk #265. Strange Tales #143. Sgt. Fury # 83. This isSTRANGE TALES # 135, published by Marvel Comics in August 1965. PLUS - Dr. STRANGE in "Eternity Beckons" by Stan with Steve Ditko art ! #16, November 1970. FN condition. Flat, glossy book, with first three interior pages partially loose at lower staple, and a what appears to be a small date notation on the cover. Attractive copy with white pages. An asteroid is being drawn off-course directly toward Earth, impact only hours away! ---- -------------- ------ ----check out the pic for a great look----------------------------------------------------------------------- ----------------------------------------------------- -. HERE IS YOUR CHANCE TO GET A COPY OF STRANGE TALES # 135, FROM AUGUST 1965. 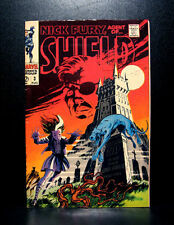 THIS BOOK FEATURES THE 1ST APPEARANCE OF NICK FURY, AGENT OF SHIELD, ALONG WITH APPEARANCE BY DR. STRANGE. THIS BOOK GRADES IN AT A VG- (3.5). HERE IS YOUR CHANCE TO GET A COPY OF STRANGE TALES # 136, FROM SEPTEMBER 1965. 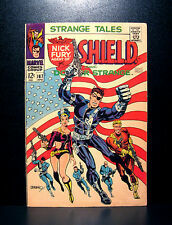 THIS BOOK FEATURES THE 2ND APPEARANCE OF NICK FURY, AGENT OF SHIELD, ALONG WITH APPEARANCES BY DR. STRANGE, DORMAMMU, AND BARON MORDO. "Thus Speaks Supremus!". 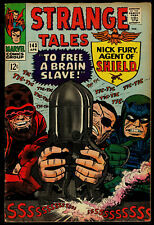 Feature Story: Nick Fury, Agent of S.H.I.E.L.D. Tony Stark explains how only an "image projected onto a force field" was "killed", and the 4 assassins left alone so they could report back to whoever hired them. 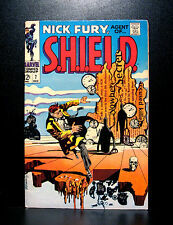 Nick Fury, Agent of SHIELD #4 - CGC 8.5 VF+ Marvel 1968 - Origin! Jim Steranko! Significance = Origin of SHIELD! Classic Jim Steranko cover and art! 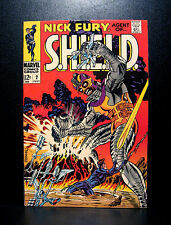 Title, Number = Nick Fury, Agent of SHIELD #4. Condition = CGC 8.5 VF . 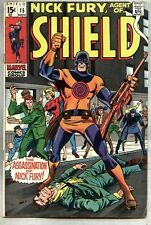 Nick Fury, Agent Of... Shield #1 Signed By Jim Steranko at I like comic con in Vancouver, Wa 2018. Check my reviews. See pictures for Condition and grade. Fast feee secure shipping. Please let me know if you have any questions? Classic STERANKO cover. Fury and SHIELD plays a key role in the CAPTAIN MARVEL film! Nice Marvel key. Nick Fury, Agent Of SHIELD #4. are only my opinion. I do my best to grade fairly. -Staples, cover, all pages attached. "Hell Hath No Fury" with story and art by Steve Parkhouse and Barry Windsor-Smith (pencils) / Barry Smith, Sid Greene (inks) (20 pages) featuring HYDRA and SHIELD turning against Nick Fury. Not counting covers this was Barry Smith's fifth story for Marvel. Gary Friedrich (plot, dialogue); Herb Trimpe (plot) (Script), Herb Trimpe (Pencils), Sam Grainger (Inks), ?. (Colors), Jean Izzo (Letters). cover Herb Trimpe (Pencils) Sam Grainger (Inks). Feature Story: Nick Fury, Agent of S.H.I.E.L.D. Nick Fury, Agent of S.H.I.E.L.D. #1 VF- 7.5 Jim Steranko cover and art, nice! A decent online price guide for help estimating value is Nostomania (. I suspect this is a bindery defect similar to Marvel Chipping since there is a smaller chip out of the next interior page. Don't forget to check the Nostomania sales and price chart on this one. ). Nick Fury, Agent of S.H.I.E.L.D. #8 NM 9.4 Oakland Pedigree! I have a few more of these and unless this one does well will just slab those. It doesn't get better than that. Don't forget to check Nostomania sales and price chart on this one. Is the item pictured the exact one for sale?. Multiple art pages can easily be combined because they are light and thin. For instance, two statues require a much bigger box. A RUN will be a collection of consecutive issues with no breaks in between them. Steve Parkhouse (plot, dialogue); Barry Smith (plot) (Script), Barry Smith (Pencils), Barry Smith; Sid Greene (Inks), ?. (Colors), Irving Watanabe (Letters). Feature Story: Nick Fury, Agent of S.H.I.E.L.D. Slight mis-cut but very nice book with very little general wear. I know how to grade. Cover by Jim Steranko (his final for the series). However, he's mistaken by a cop as a drunk, and when his felow agents show up, the drug causes him to see them as 3 of his worst enemies! ; Dum Dum, Jimmy & Gabe, who've been following in their van, almost crash head-on, when suddenly the vortex beam picks up both vehicles! Notable Appearances/Storyline/Artists: Yellow Claw appearance. 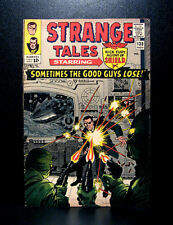 ( 1 ) Strange Tales comic book. Issue: #165. Publisher: Marvel. Circa Year: 1968. -Severe soiling/foxing on back cover. We will help you in any way that we can. Amazing Inventory of Gold, Silver and Bronze Comics and Original Art. including a hugehalf-price section! Writer: Jim Steranko. Interior Artist: Jim Steranko & Dan Adkins. Cover Artist: Jim Steranko. Publication Date: August, 1968 (The date in the title refers to the year the title started). We are always buying!